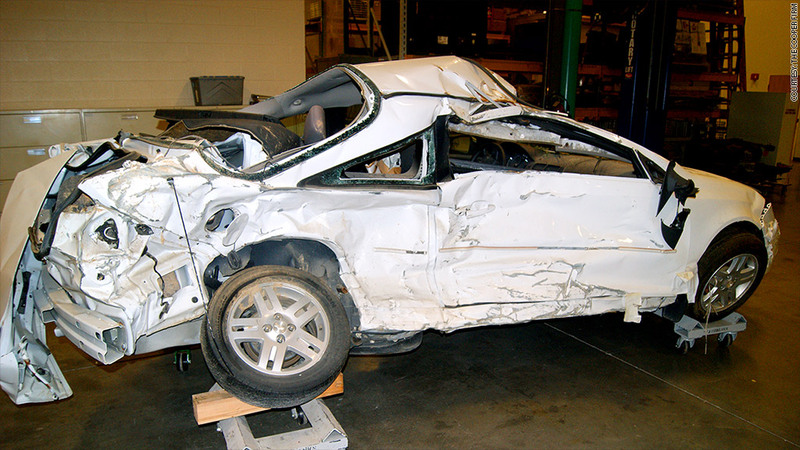 A Chevrolet Cobalt involved in a 2010 fatal crash that resulted in a legal settlement between GM and the family of the victim. But GM does not face potential legal liability for the crashes that took place before its 2009 bankruptcy. There's a strong possibility that General Motors won't face legal liability for most of the 13 deaths caused by an ignition defect in 1.4 million cars built between 2003 and 2007. That's because, in 2009, GM (GM) received a shield from such lawsuits as part of its bankruptcy filing and government rescue. Claims from suits prior to the bankruptcy go to the Motors Liquidation Co., a shell corporation holding only closed GM plants and other debts. GM was facing about 2,500 cases in 2009. In most cases, plaintiffs have received only pennies on the dollar. Chrysler Group got a similar liability shield when it was bailed out around the same time as GM. GM announced the recall of vehicles with the ignition defect in February. There is evidence that engineers knew of the problem for nearly 10 years. "It's completely unfair," said Lance Cooper, a Georgia attorney. Cooper recently won a settlement from GM for a family whose daughter was killed in a 2010 accident involving a 2005 Chevrolet Cobalt, one of the cars involved in the recall. "It's not like a traditional bankruptcy where they go out of business," he added. "GM continued to exist as essentially the same company." Clarence Ditlow, executive director of the Center for Auto Safety, said his group is asking GM to waive its liability shield. "They took the government's money, but they didn't accept responsibility to the public who paid for it," said Cooper. "And it's the public that was hurt when their products injured or killed people." Cooper says most of the 13 deaths cited by GM and safety investigators took place before the bankruptcy. The list of deaths has yet to be released publicly. GM CEO Mary Barra, in a recent letter to GM employees, said "We will hold ourselves accountable" for the problems that led to the recall. When asked about the liability shield, GM and Chrysler have made only limited statements. "GM is focused on ensuring the safety and peace of mind of our customers involved in the recall," said GM spokesman Greg Martin. "It is true that new GM did not assume liability for claims arising from incidents or accidents occurring prior to July 2009. Our principle throughout this process has been to put the customer first, and that will continue to guide us." He declined further comment when asked if GM might waive the liability shield in these cases. Some attorneys have tried to sue the auto dealers that sold the cars involved in accidents, since they are independent businesses not covered by the bankruptcy. But Cooper said that can be a tougher case to make to juries. Some dealers, such as those that sold the now-discontinued Saturn line, have themselves gone out of business since 2009. Chrysler and GM both initially proposed shedding liabilities on all vehicles sold before their bankruptcies, even if the accidents occurred after the bankruptcy. Under pressure from Congress, state attorneys generals and public interest groups, both accepted liability for accidents that occurred after the bankruptcy. "Chrysler Group wants customers to feel comfortable and confident buying, driving and enjoying one of our vehicles," said Chrysler's statement on the the liability shield at that time. "Chrysler Group vehicles meet or exceed all applicable federal safety standards and have excellent safety records." A Chrysler spokesman said Tuesday that the company had no further comment on the issue. Opening itself up to liability could prove costly for GM. Ditlow said he's aware of several cases in which the automakers avoided judgments of tens of millions of dollars. He thinks total savings from the liability shield for both companies is between $2 billion to $3 billion. Toyota Motor (TM) was hit with a $3 million jury award last year for a crash that was allegedly caused by unintended acceleration of a Camry. The victims in the case were both elderly women; younger victims with a lifetime of earnings ahead of them can receive far larger awards. Ongoing medical costs and pain and suffering for crash survivors can result in even larger judgments.